*** [of 4] "Cuong Vu has yet to improve his debut recording, which opens with some of the fiercest trumpet playing you'll hear ... 'Our Bridge' finds him in yet another mode, darker and more mysterious, and not unlike Wadada Leo Smith's 'Procession of the Great Ancestry'.... Saft's Fender Rhodes has a thoroughly fresh and contemporary quality..."
"[Cuong's] playing encompasses both achingly beautiful melodies that sing like those of the Prince of Darkness and the occasional use of punchy extended techniques reminiscent of Lester Bowie....Throughout Bound, Vu's performance is remarkably assured..."
"...Vu melds lustrous tonalities and lyrically rich lines with the often turbulent and thoroughly striking support provided by fellow New York City based virtuosos, drummer Jim Black, electric bassist Stomu Takeishi and keyboard whiz Jamie Saft.... Bound is brimming with ingenuity yet also packs a heavyweight punch! Highly recommended "
"The clarity of Vu's sound is astonishing, and this band may be bound by an avant jazz pigeonhole, but not ever gagged by it.... Vu's concept is unique and distinctive ... fully charged with depth, substance, and fine musicianship. Recommended." "Vu has put pieces of the jazz puzzle together in a highly individual and compelling way." "An obviously busy cat with much to offer, this is his debut release and his time has come! If you thought he was a mere jazz musician, there is much more here than meets the eye. His tunes are quirky and hard to pin down, the grooves are all slightly twisted.... A most impressive debut from a new trumpet hero." "Powerful, inspiring music.... while this is an album rooted in jazz, it is also one which shows a strong understanding of classical and even pop music. Yet this listener, at least, never feels that Vu is 'looking back' at other people's music. Rather, he pushes the envelope of music forward, melding these traditions with new and unfamiliar (but very listenable) rhythms and tones. The power and originality of these compositions is certainly reason enough to listen to Bound, but equally of note is the beautiful tone and amazing skill of Vu's trumpet playing.... Bound is an energetic, emotional album, and one that reveals more each time it is listened to. I highly look forward to future releases." "...outstanding —very emotional jazz in a classic style." 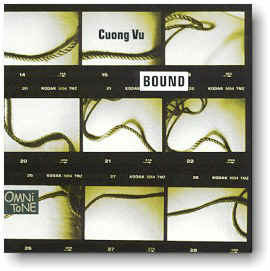 Buy Bound now in OmniTone store.